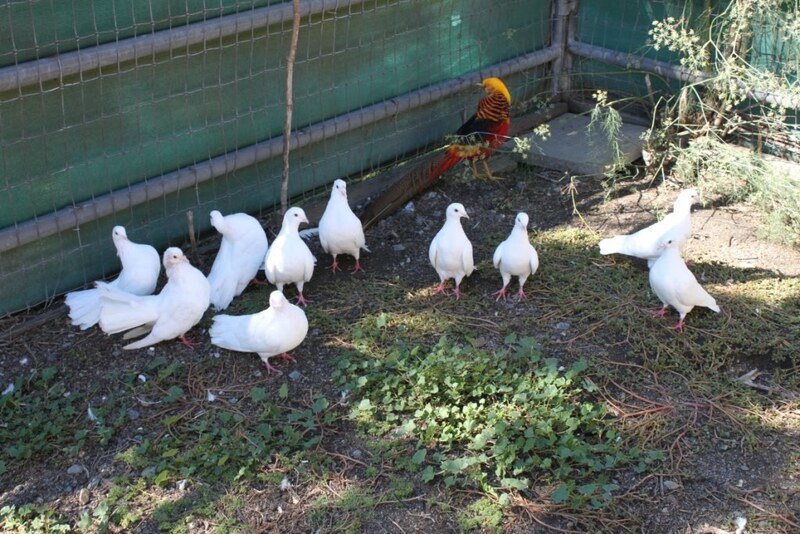 Sometime in September, a gentleman lost his home and surrendered his flock of 12 pigeons and a golden pheasant to Marin Humane Society. 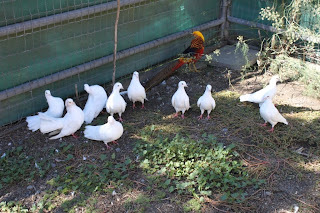 They are extremely lucky birds to wind up at this shelter where, rather than live indoors and isolated each in their own too small cage (as most shelter pigeons are housed), they get to live together as a flock in a large barn stall with an attached, mesh-covered outside area where they can lounge and sun/rain bathe and be birds. 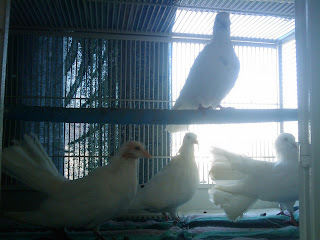 Though I'm too full up with foster pigeons already and am supposed to be reducing rather than increasing my numbers, these four birds needed to come out of the fast lane of flock life in the shelter and into the slow lane of foster care. All of our other fosters are all full up as well and, with 4 birds of unknown condition, it was just easiest to take them into my direct care than to try and help long-distance manage their care through a new foster volunteer. 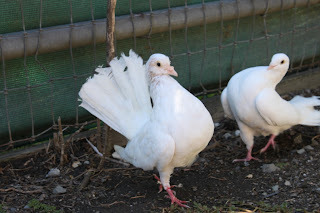 Felix is a fantail that had been bullied so long that he had significant feather loss (a sign of having likely been living in overcrowded conditions) and labored breathing and, though they didn't act like mates at the time, he was being kept company on the flock edges by Harper- a homer with a huge, untreated ruptured feather-cyst. They've been doing great here. Felix has new feathers coming in and his breathing is improved. Harper will be going to the vet this week to have her cyst removed. They've been relaxing and settling in. And now they are courting. Previously, I don't think they felt well enough nor safe enough to think about romance but now they do. If you'd like to support MickaCoo Pigeon & Dove Rescue's efforts, please click on this link and follow the directions to donate. Every gift, whether large or small, makes a big difference for these so often overlooked birds. On 10/19, I took Harper to have her ruptured feather cyst removed. Her mate Felix came along for moral support. The staff at Wildwood Vet Hospital in Portola, including Avian Vet Tech Sherry and Dr. Chris Sanders took gentle, patient care of both Harper and I. 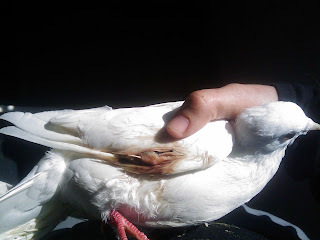 It's as if Harper was making a diamond out of the ingrown flight feathers and ruptured cyst that she had been coping with for a long time (I'd guess over a year). I can't imagine how uncomfortable it must have been for her to put up with. The thing was big (about the size of a small lady's thumb) and It was hard as a rock. The cross-hatches in the image below are from a saw that was used to try and fracture it. No bird likes having crap on their feathers and I'm sure in addition to the pain and pressure Harper felt (imagine the world's worst ingrown toenail), she was also very annoyed to have this impossible-to-remove imperfection getting in the way of her preening. Harper tolerated the procedure very well. They were of course both very happy to get home and resume courting. On the 21st, per doctor's orders, I removed the stent that had been left in the wound (in order to help it heal in such a way as to not impede the flight feathers to come). While still swollen, the area was healing well. Yesterday, Harper laid the first of a pair of eggs and they are very proud and happy. Neither felt well or secure enough to be mating and planning to raise a family two weeks ago. This picture is from today and shows how quickly and well the wound is healing. 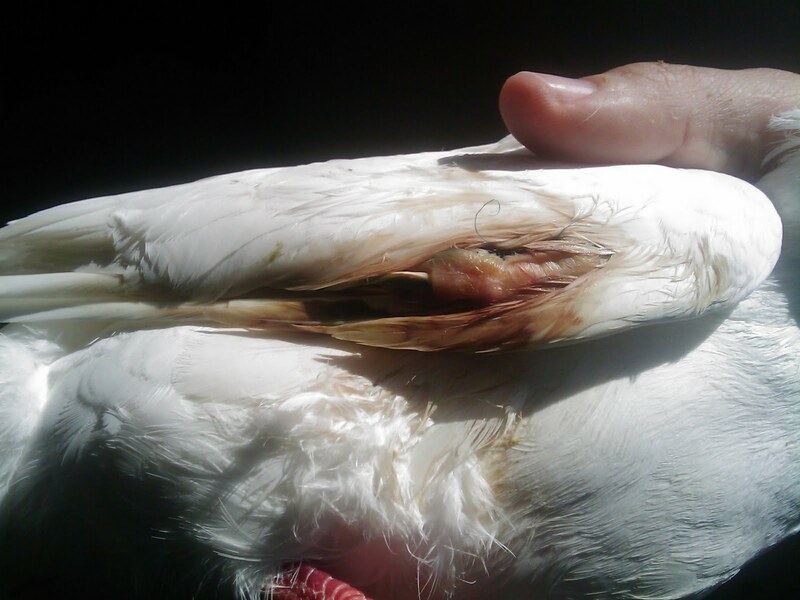 Pigeons are very hardy and resilient and have amazing abilities to heal and thrive. If you can contribute towards Harper's care, please click on this DONATE link and follow the directions to donate. Whatever you're able to give will help. Felix and Harper are a very sweet little couple and next they need a wonderful, forever home. If you'd like to foster or adopt, please complete this online adoption application. 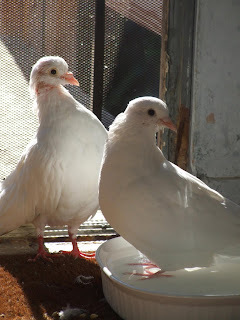 And join us on Facebook to get all the latest updates on the pigeons and doves of MickaCoo.